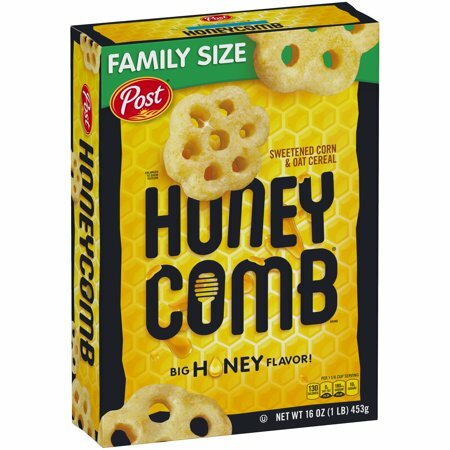 Honey Comb Breakfast Cereal is a classic family favorite from Post Cereal. Honey Comb classic shape great for breakfast or an anytime snack. 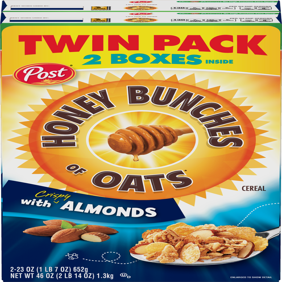 This cereal has 8g of whole grain per serving. An excellent source of vitamin D and provides 10 essential vitamins and minerals. Ingredients: Corn Flour, Sugar, Whole Grain Oat Flour, Modified Cornstarch, Corn Syrup, Honey, Salt, Turmeric (Color), Wheat Starch.Vitamins & Minerals:Ferric Orthophosphate (Source of Iron), Niacinamide (Vitamin B3). Zinc Oxide (Source of Zinc), Thiamin Mononitrate (Vitamin B¹), Calcium Pantothenate (a B-Vitamin), Pyridoxine Hydrochloride (Vitamin B6), Folic Acid. Honeycomb, just isn't a cereal to be eaten- it's much more! It's a 24/7 snack, that is good with a soda, milk, water, etcetcetc. Personally, I have always loved Honeycomb! But not in it's "intended" state (bowl, spoon & milk). Rather I prefer a bowl full or a snack ziplock Baggie, and they are great to have as a snack!! I like to make up several baggies, when I get a new box, to have ready to take with me on the go!! We love Honeycomb cereal -- it's just sweet enough, doesn't need extra sugar, and is good for snacking out of the box. Purchasing the family size means it lasts longer, it's a good value and doesn't have to be purchased so often. is this cereal gluten free? 1. No, this cereal is not gluten free.